Click the link or image to download the list PDF file. *DISCLAIMER* List is representative of “marked” locations, which are likely to be installed. Does anyone know if there is a bike rack convenient to 800 W. 6th Street and Flower in DTLA? My building is refusing to allow me to bring my bike upstairs to my office. Fill out the form and have one put in! There are several a block away or less. Central Library, City National Plaza (art rack used by messengers a lot, and right in front of your building on Flower), 7th & Fig. In front of the Library there are at least two, and I think there’s one across the street near the steps. I have used a couple of these racks. 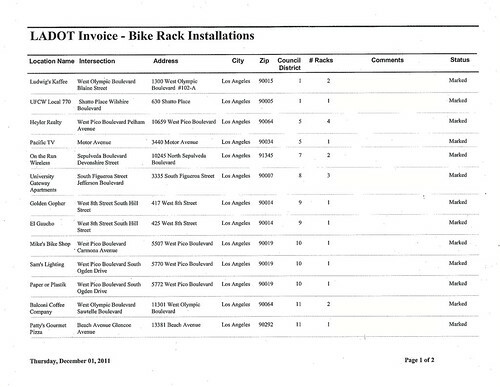 They are not on LADOT’s map, I suppose because they were installed long ago. Unfortunately, the owner of Galco’s did not want to have racks in front of their establishment. Me too. I always thought that the public owned the public sidewalks. I wonder what would happen if I said I didn’t want a car parking spot on the street in front of my business? After all, car parking is detrimental to some businesses–say, sidewalk cafés. Actually, it’s detrimental to the public treasury, as much as those spaces cost to build and maintain, and to the public health, since they are a known root cause of congestion and, indirectly, accidents. Man, I really don’t want to have car parking in front of my place! But I have no choice in that. Only bikes get the shaft.